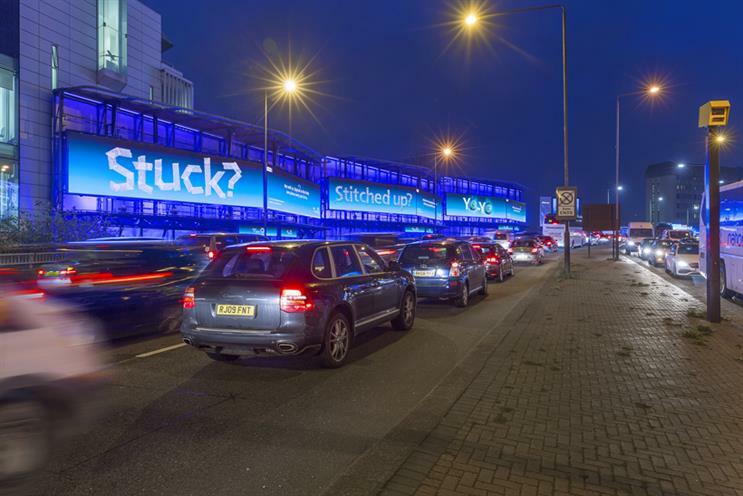 O2 has launched out-of-home poster ads asking if motorists are feeling "stuck", in the week when much of the UK has ground to a halt due to snowstorms and sub-zero temperatures. The campaign, placed by AdCity, the specialist out-of-home division of Havas, has seen the brand use traffic data to show the "Stuck" message when vehicles are slowing to speeds of under 10mph. It follows reports of motorists being stranded on snow-clogged roads across the country, notably in Scotland. The creative – by VCCP, promoting O2's annual upgrade deal – is the latest iteration of O2’s ongoing "Choose" campaign, is also running on OOH screens in train stations, where passengers are facing delays and cancellations due to bad weather. As part of the campaign, O2 is also running ads on special build sites by Clear Channel, which appear to have been stripped back to their chipboard base and with a printed created taped on top. It follows the brand’s feted "Oops" ads, which rolled out in September, promising to replace new mobile customers’ broken screens. Last month, O2 revived its "Follow the rabbit" campaign to coincide with the Brit Awards. The trippy film is set to a track by electronic duo The Chemical Brothers.